The Turnaround Management Association (TMA) is the most professionally diverse organization in the corporate restructuring and renewal, and corporate health space. Established in 1988, TMA has nearly 10,000 members in 52 chapters worldwide, including 32 North American chapters. Members include turnaround practitioners, attorneys, accountants, advisors, liquidators, consultants, as well as academic, government employees, and members of the judiciary. Visit turnaround.org for more information and to join. TMA is about more than just turnaround. View our mission and vision statements by clicking the image below. TMA shows members value by providing networking, educational resources, and certification to members whether they practice at the local, regional, national, or cross-border level. TMA ensures that the critical role our members play in the global economy is understood, respected, and celebrated. All TMA members are expected to abide by a Code of Ethics, specifying high standards of professionalism, integrity, and competence. In principle and in practice, the Turnaround Management Association (TMA) and its chapters value and seek diversity and inclusiveness. 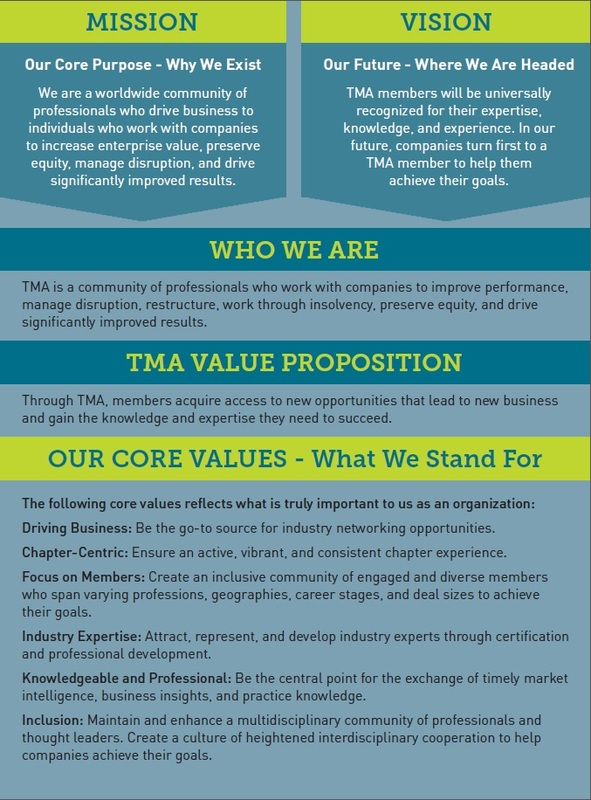 TMA welcomes all industry professionals as members, leaders and participants consistent with the organization’s diversity values. With this in mind, TMA is committed to including representation from a broad range of identity groups in the membership and all of its leadership, programmatic activities, and business of the Association. Identity groups include and are not limited to age, appearance, disability, ethnicity, gender, gender identification, geographic location, nationality, professional level, race, religion, and sexual orientation.